HAUBSTADT—Father Hilary Meny entered Saint Meinrad Seminary in St. Meinrad just weeks before the stock market crash of 1929. During the Great Depression that followed, he learned many hard lessons about faithfulness, perseverance, stewardship and flexibility. 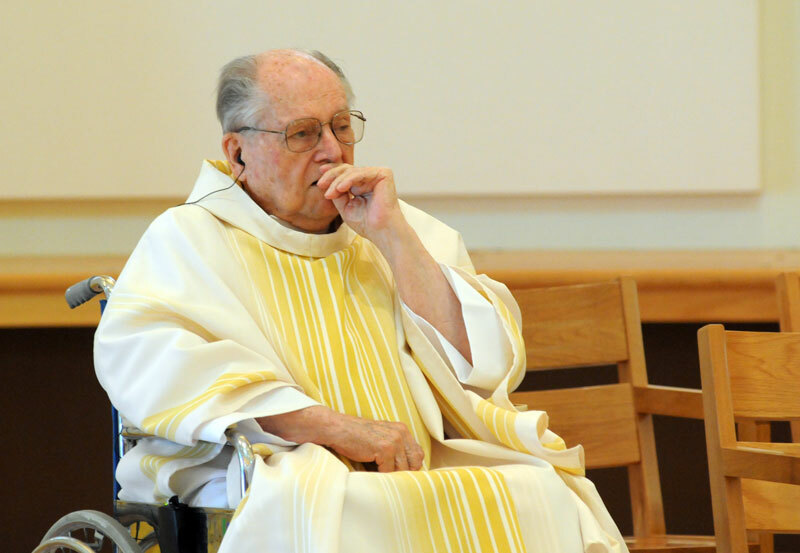 These and many other qualities define the life and ministry of Father Meny, only the second priest in the history of the Archdiocese of Indianapolis to mark 70 years as a priest. Ordained in 1940, Father Meny, now 95, has lived for the last two decades around the block from the home in which he was born in 1915 and where he learned those lessons so long ago. He moved there after he retired from active ministry in 1990. For some four decades before that, he had served as the pastor of the former St. Patrick Parish in Madison. But during those years in ministry along the Ohio River, Father Meny was more than simply a pastor. He personally rewired the parish church and rectory—a skill he had seen his father use when houses were first being wired for electricity in his hometown. He repainted the parish church on his own, sometimes climbing up a 60-foot extension ladder to do so. And Father Meny led the effort to establish Father Michael Shawe Memorial Jr./Sr. High School and Pope John XXIII School, both in Madison, and he continues to support them today. Father Meny may have learned to have the flexibility to accomplish so many jobs at once while still being faithful to God when he was a boy growing up in Haubstadt. “As a boy, from the sixth grade on, they had distribution of Communion at 6 [a.m.], or just about at that time,” he said. “Of course, I only lived half a block from the church. So I’d be at church for Communion in the morning. “Then, after that, I’d come home. Then I’d do the grocery shopping and the meat market buying for my mother. And I’d go to the post office. In those days, they didn’t have house delivery. Father Meny slowed down enough, though, to watch his hardworking father, Bernard, take care of his family home. His father wired the house for electricity and painted it. He was also a good carpenter and cabinet maker. And during the Depression, he learned to repair clocks and watches to supplement his family’s income. After graduating from the eighth grade at SS. Peter and Paul School in Haubstadt, Father Meny entered Saint Meinrad Seminary. Although 50 miles from home, Father Meny still knew well how hard his father worked to support him. After Bishop Joseph E. Ritter ordained him to the priesthood on May 14, 1940, Father Meny was assigned as an assistant pastor at the bustling St. Philip Neri Parish in Indianapolis. The east side parish had scores of families, many of Irish descent, at that time. St. Philip Neri had five priests and 33 members of the Sisters of Providence of Saint Mary-of-the-Woods on its pastoral staff. But it was also highly in debt at the time—to the tune of $287,000, according to Father Meny. While ministering there, St. Philip’s pastor at the time, Father Albert Busald, put Father Meny in charge of a weekly lottery to help pay for parish expenses and reduce its debt. But the parish was rich in young men who were open to the priesthood. According to Father Meny, St. Philip at one time had 38 seminarians in formation at Saint Meinrad. One of them was Benedictine Father Timothy Sweeney, a previous archabbot of Saint Meinrad Archabbey, who said Father Meny influenced him in his vocational discernment. Father Meny also ministered at St. Philip throughout World War II, a time when he witnessed many marriages. Father Meny spent seven years in ministry at St. Philip Neri, and then spent one year each at St. Joseph Parish in Clark County and St. Vincent de Paul Parish in Bedford. In 1949, Archbishop Paul C. Schulte assigned Father Meny to be the pastor of St. Patrick Parish in Madison. Father Meny would remain there until he retired in 1990. He has a simple answer for why he stayed there for so long. He also acknowledged, though, that the character of his parishioners kept him there, too. Although his parishioners weren’t wealthy, he soon learned that they were dedicated, especially to their children’s education. While still in his mid-30s, Father Meny was given the challenging task by Archbishop Schulte of leading a fundraising drive to build a new Catholic high school in Madison. After Father Michael Shawe Memorial Jr./Sr. High School was opened in 1954, Father Meny took on other duties there. He served as the school’s superintendent, was a religion teacher, and even mowed lawns and trimmed shrubs. But as much as he put his heart and soul into Father Michael Shawe Jr./Sr. Memorial High School—and Pope John XXIII School, which he helped to establish later—Father Meny shies away from taking any credit. Aaron Barber, 82, and his family became members of St. Patrick Parish in the early 1960s. Barber was always impressed by Father Meny’s generosity, which echoed his father’s giving nature in supporting his own education so long ago. Father Meny makes those monthly contributions to an endowment fund that he helped establish for Madison’s Catholic schools, which is operated by the Friends of Shawe and Pope John School. Carolyn Pagel, 72, became a member of St. Patrick Parish in 1964, and worked for Father Meny for many years in the parish office. The hard work that Father Meny did to maintain the physical plant of the parish and schools, and care for the spiritual lives of parishioners, was always rooted in prayer, said Dolores Hellmann, 87, Father Meny’s longtime sacristan at St. Patrick Parish. Father John Meyer has led the Catholic community in Madison since Father Meny retired 20 years ago, and knows his predecessor’s influence is still felt there.